2K has announced the launch of NBA 2K15 on mobile devices. Developed by Visual Concepts, a 2K Studio, the game promises gamers the most “true-to-life” NBA experience they’ve ever seen on mobile, with multiple gameplay modes that look to capture the feeling of the console game. 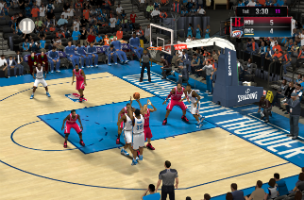 NBA 2K15 offers a full MyCareer mode with “expanded features and options” over previous releases, as well as modes for Quick Games, Season and Blacktop games. The game also includes improved graphics for arenas, player models and animations, as well as a soundtrack curated by artist and producer Pharrell Williams. When first starting NBA 2K15, players create their “MyPlayer” avatar, choosing a stock player template and then customizing that avatar using controls for skin tone, muscle tone, eye color, hair style, hair color and more. While playing, gamers have the option of using a real-world controller, or using one of three sizes of virtual controls. These virtual controls offer a joystick for movement and buttons for passing, shooting, dribbling, blocking and switching between active players. These buttons change automatically, depending on the role the active player is current playing (whether they control the ball, for instance). When taking free throw shots, the game gives players a rating based on the timing of their shot, so they can improve by paying attention to these critiques. The game’s pause menu offers options for coaching tips, timeouts and game stats. In MyCareer mode, users have access to text choices and other features that allow them to customize the way their career unfolds. NBA 2K15 is available to download for $7.99 on the iTunes App Store and the Amazon Appstore for Fire Phone and Kindle Fire HDX tablets. The game is coming soon to Fire TV and Google Play.